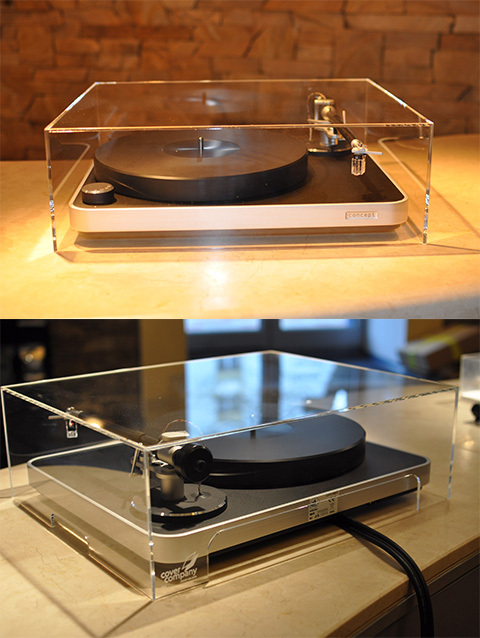 On the left and right hand side you will find a recess in order to be able to lift the cover off easily when you are playing your records. The dust covers have a large recess at the rear side in order to accommodate the passing through of various Tonearm cables. 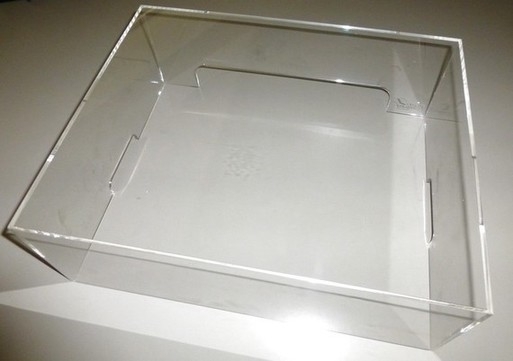 Basic material we use PMMA Acrylic sheets from high quality suppliers. The sheets are cut to size and all edges are machined to 45 degrees. Then the panels are glued together. So our covers are not folded but glued to sharp 90 degree edges. The thickness of all panels is 4mm. Machined to precision acrylic material by CNC cutting and then folding it to the desired shape by use of a rig and heat. On the left and right side you'll find a cut-out grip for easy handling. At the back we made a Large centered 32x5 cm cut-out for power and signal cables. All edges as well as the side-grips and cable cut-out at the back are polished for a smooth look and feel. All together our covers are German Quality made.... and still affordable. Wall thickness is 4mm so total inside dimensions (compared to the outside dimensions) are 8mm less for width and depth and 4mm less for height.